It is hard to believe that the term was originally coined more than half a century ago in the US and was done so in against the grain of the then prevailing concept of cities for motorists. It was a radical vision for that time and only slowly gained traction – the notion of ​​cities created by and for the people. However, it did eventually capture the imagination, and so non-profit organisation Project for Public Spaces (PPS) was established in the mid-70s. Its main goal was and still is to promote the concept of ​​placemaking. 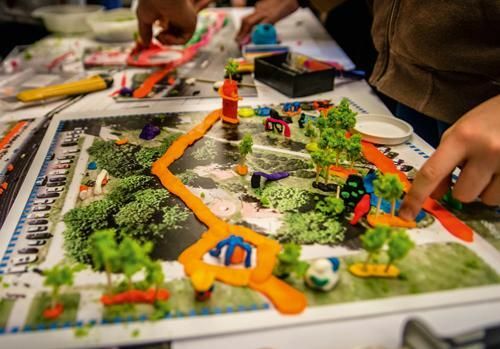 Since its conception, placemaking has been identified with the grassroots activities of local communities aimed at improving the attractiveness and functionality of urban space. It is a process and a kind of philosophy that embraces the principles of urban design. Placemaking can therefore be described as a multi-faceted approach to planning, designing and managing public spaces. It is also important that such place creation utilises the assets, inspirations and potential of the local community, with the intention of providing areas that promote health, happiness and well-being. And who wouldn’t want those last three words to be the hallmarks of their own project? It’s little wonder then that the concept of placemaking was eventually appropriated by corporations and adapted to their own needs. According to PPS, however, what they did could be a distortion of the original ideal. “Placemaking is not the same as constructing a building, designing a square or creating a shopping zone. Due to the fact that many more communities are involving themselves in place creation and more and more professionals are beginning to call their work ‘placemaking’, it’s important to preserve the importance and integrity of the process,” states a study by PPS. And developers don’t need to be told this by the organisation. Some actually seem to agree that the word is often overused. “If a developer claims that they are engaged in placemaking activities, they are either lying or don’t know what placemaking means or where it came from,” says an employee of one developer, who preferred to remain anonymous. From a theoretical point of view, it is rather difficult to refer to activities designed to make a profit – and this is how private enterprises function – as placemaking. However, it cannot be overlooked that some of the ideas and solutions that have been developed over the decades by grassroots placemakers have been adopted by enterprises and cities. More and more projects are also being created in line with the changing expectations of local communities – and even with their involvement. Companies have been increasingly lending their ears to the voices of local residents. “Before starting any project we try to reach out to the current and future users of the part of the city we are changing to identify their needs. We also work with local non-governmental organisations that know the history and character of the place. All of this provides us and our architects with invaluable knowledge for the subsequent design work,” claims Adam Targowski, the manager of sustainable development in Skanska’s office division. Nicklas Lindberg, the CEO of Echo Investment, also insists that the idea of ​​placemaking is very important for the developer’s flagship projects, such as Browary Warszawskie and Moje Miejsce in Warsaw, as well as future developments Tymienieckiego in Łódź and Wita Stwosza in Kraków. “They will combine residential, office and retail functions, but the most important thing is the public space between the buildings, which will integrate our project with the city and create a meeting place. That’s why we expend a great deal of energy analysing the urban functions that are missing in the area and how we could supplement this. Wola district is currently the largest construction site in Warsaw, but it is difficult to find green, peaceful squares in it. That’s why a large part of Browary Warszawskie as well as the Towarowa 22 project will be green,” explains the company’s CEO. Placemaking advocates and developers focusing on friendly public spaces would seem to be directed towards a similar goal – the users’ feeling of well-being in such places. While development activities may not be included in the concept of placemaking as a process, if the final result is the creation of vibrant public areas, then they are at least compatible with its spirit. Something of the sort has already taken place in Wola district. 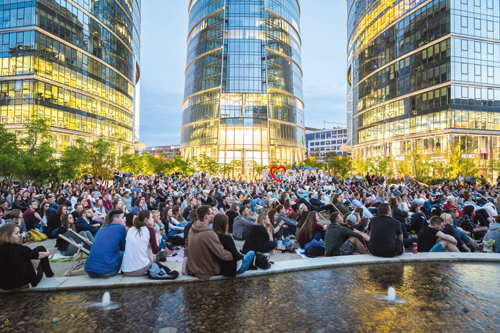 “In the case of Plac Europejski an area has been created with the intention of becoming a focal point for recreation, which will continue to function as such outside the working hours of the surrounding offices,” explains Jarosław Zagórski, the commercial and development director of Ghelamco Poland, the developer of the Warsaw Spire complex in which the square lies. “Our plan, as early as the design stage, was for there to be a number of eateries and an open-air art gallery. We also decided that it would be a place free from car traffic. A special team was set up to supervise the space: from organising exhibitions in the gallery, special events such as a summer cinema, an ice rink, etc., together with ensuring constant contact with the users of the space. An important point to remember is that the success of Plac Europejski is the result of listening to the needs of both the tenants and the residents who spend time there,” adds Jarosław Zagórski. He points out, however, that the way it is managed should be determined by the location and the needs of its users. That is why it’s necessary to think about who will be using the space at the design stage: will it only be the tenants of the building – or maybe also local residents or other groups? Because the requirements of these groups have to be defined from the very outset. Nevertheless, this has not always been the case. Placemaking has a short history in Poland, going back just a few years at the most. 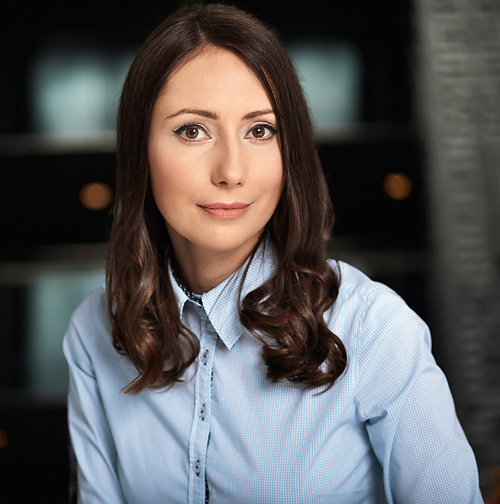 Joanna Ejsmont, the coordinator for sustainable development at Skanska Property Poland, explains that placemaking in Poland began to emerge on a noticeable scale together with local authority participatory budgets. When it comes to real estate developers involved in placemaking, the history seems to be even shorter. Skanska is one of the pioneers on our market. It gained its first taste of this approach in 2013 as one of the partners in the revitalisation of the square at Krochmalna 3 in Warsaw. It was a small CSR kind of project for the developer, but was notable for being the Project for Public Spaces’ first involvement in a Polish scheme. Skanska took on a project with a slightly larger scale in 2015, when it took part, together with the city and local associations, in the creation of the Superścieżka public zone between the Rondo Mogilskie and Rondo Grzegórzeckie roundabouts in Kraków. The design of the 500m pedestrian route was drawn up with the involvement of residents during workshops coordinated by Fundacja Aktywnych Obywateli im. Józef Dietla [the Józef Dietl Active Citizen Foundation]. As a result, the square was revitalised, a bicycle path was renovated, while a playground, a fountain, greenery and new outdoor furniture were added. “This also stems from a certain trend across the world for us to no longer perceive urban space as a conglomeration of private space but as a common good that needs to be created through cooperation,” explains Adam Targowski of Skanska. At about the same time Skanska collaborated again with the Project for Public Spaces (and the Na Miejscu foundation) over the planning of the public area in and around the Spark office project in Warsaw. Input was provided by local residents and potential tenants for the shape the project would take. As a result, it will feature an amphitheatre, as well as a lift for cyclists and a stretching zone on the patio. The placemaking, however, went far beyond just the complex itself. The study drawn up after the consultations recommended the removal of a pedestrian subway under ul. Wolska, one of the main transport routes leading to Spark, replacing it with a ground-level crossing, while the greenery in the neighbouring Kolonia Wawerberga estate has been re-designed. According to Adam Targowski, each new project Skanska launches now involves placemaking. According to Karina Koziej, the director of strategy at Placemakers, an organisation that assists developers carrying out placement projects, the first task is fostering contacts with local residents. “If we were to pick out random individuals, asking passersby on the street corner, we would not be able to achieve the best results. It’s much more effective to find someone who already has the trust of the local community, who knows it well and can represent their views,” she explains. If a local residents’ association or community council exists, then this initial goal can be much more easily achieved. Once these first contacts are made, the locals can then express their views through a variety of consultative tools, such as questionnaires, surveys, interviews, discussion panels attended by experts and residents, or, as in the case of the Spark project, neighbourhood picnics. These are all ingredients that can be combined for successful placemaking. The aim is to involve residents and other space users (e.g. tenants, employees, etc.) and come up with a list of recommendations that architects and designers can then implement. However, the result will still be just a preliminary concept that then has to be presented to the stakeholders to see if they think everything is going in the right direction. “It is quite a complicated process and sometimes lengthens the duration of the project. However, what it does do is avoid just transplanting a project into a place where it doesn’t belong. Such a transplant can be rejected – if it is an unwelcome surprise to the local residents and they decide they never wanted it in the first place. By contrast, a jointly created project is often something that has been anticipated for some time, and so when it finally appears the feeling among the locals and users is that it hasn’t been done without their knowledge or behind their backs,” argues Karina Koziej of Placemakers. She adds that many developers could also spare themselves the many hassles related to objections and protests – and could even sometimes save their projects from turning into total fiascos – if they embraced this approach. “However, it has to be borne in mind that the process for creating an attractive place does not end with the construction of the project. It is just the beginning. The way the place is managed is equally important,” she emphasises.